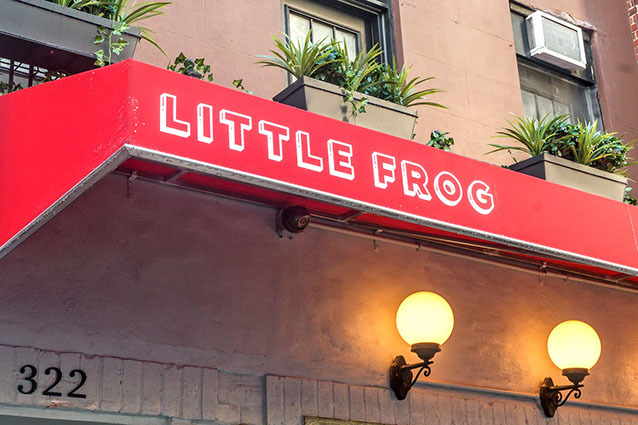 Little Frog, a chic modern-day reinvention of the classic Parisian-style bistro, has become an Upper East-Side favorite. And for good reason. So many people think they’d like to own a restaurant, and celebrities give it a try all the time. It sounds so convivial. So welcoming. But it’s not an easy business, by any means, because it’s one where unforeseen problems pop up with unnerving regularity. That’s why experience counts. At the helm of Little Frog is the owner, the congenial François Latapie, a gracious host who previously co-owned and operated La Goulue, Orsay, and Lyon. After which he became the operations director for Bagatelle Group, which has restaurants in some of the chicest watering holes around the world: Think: London, Dubai, St Barth’s, and so forth. Their flagship restaurant, Bagatelle, with its French Mediterranean atmosphere and cuisine, is a block from the Whitney Museum in the Meat Packing District and still drawing the downtown crowd. After a decade. If you’re opening a restaurant, what could possibly go wrong? A lot. For Little Frog on East 86th Street, between First and Second Avenues, there was the on-going saga of the interminable reconstruction of the Second Avenue Subway. No sooner had the restaurant opened in November 2016, when the MTA crews turned up to widen the block-long sidewalk. That ‘frogs’ don’t need wide sidewalks or chain-link fencing made no difference to the powers elite. All of which initially resulted in low foot traffic, turning ‘the Little Frog dream’ into a restaurateur’s nightmare. That was then, but now the crews are long gone. As we entered Little Frog last Tuesday evening, a gentleman dining alone at the long bar, was enjoying a flute of champagne and a half-dozen oysters. À votre santé, monsieur. I appreciate places that accommodate singles dining alone, especially here in Manhattan where 54 % of apartments are said to be single-owned and occupied. What happened next, no fault of the restaurant, was that my RESY reservation was missing. Fortunately, I had a copy in hand. 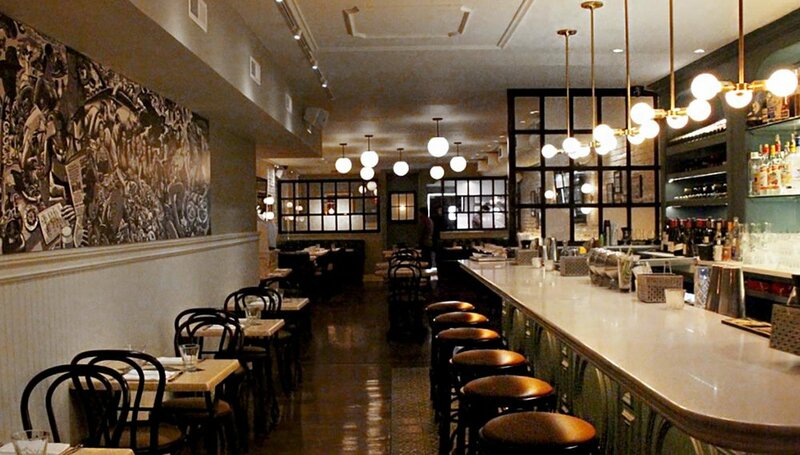 Heading the kitchen is the talented Executive Chef Xavier Monge formerly of the top drawer Minetta Tavern—who is now offering classic French fare like coq au vin classique, steak frites, garlicky frogs’ legs and a chocolate pot de crème. That evening I enjoyed a heavenly ‘Roasted Chicken Sous La Brique’ ($29.OO) served over polenta with a swirl of mushroom sauce. What won over my taste buds, even before the first bite, was that sprig of tarragon. Magnifique! The French (and I) adore tarragon, but in my humble opinion, it’s not used nearly enough. As for my companion? Moules Frites ‘Marinieres,’ ($26.00) something he’s an expert on. But don’t you love the serving pot? And for all of you vegetarians, the young lady seated next to me raved about the creamy ‘Spring Vegetarian Risotto’, with English peas, ramps, mushrooms and spinach. Parmesan cheese optional. The wine list is extensive, with no fewer than seven whites and seven reds by the glass. Modestly priced. Gone are the bottles over $100. To think that this lovely bistro is in Yorkville, where my grandmother grew up as a young girl, only a few blocks from home. And that dinner is served every night and brunch on weekends. What are we doing tomorrow evening? And so will I. And once again, it’s that time of year where I’d like to wish you and your loved ones a most Happy Easter and a Happy Passover. Until we meet again, may life be good to you. That’s all for this week mes amis. Hope to see you back after the holidays when I’ll have the coffee brewing. What’s you opinion of cold-brewed coffee? Should I give it a try…why? À bientôt.